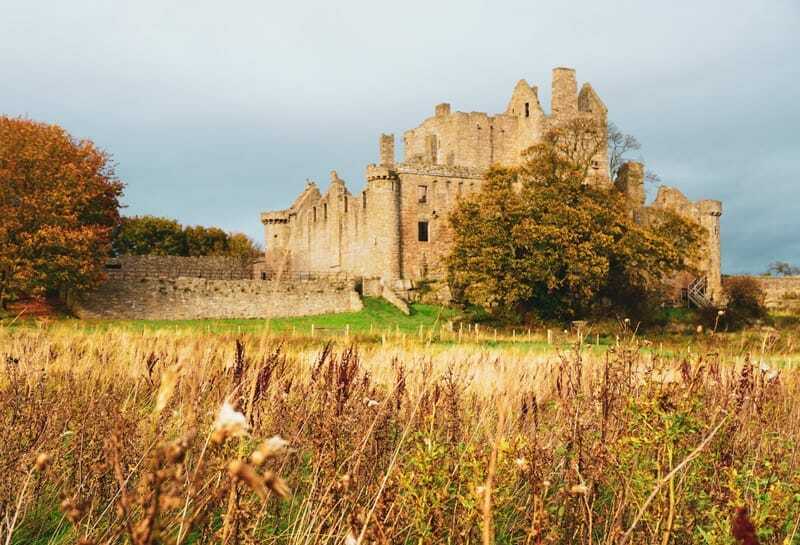 Craigmillar Castle in Edinburgh is home to one of the filming locations for the recently released Netflix blockbuster Outlaw King– the untold true story of King Robert the Bruce. Though Craigmillar castle wasn’t around when the real King Robert was alive during his reign in the early 14th century (building commenced almost 50 years after his death), the large, picturesque castle ruin made a fantastic filming location. PLANNING A TRIP TO SCOTLAND? Check out my Ultimate 10-Day Itinerary! Surprisingly, Craigmillar Castle is one of Edinburgh’s least visited attractions. This could be due to the abundance of attractions in Edinburgh’s Old Town, though it is located only 3 miles away, and easily accessible by bus. I doubt this will be the case for much longer; Outlaw King is expected to spark even more interest for Scotland as a tourist destination- and Craigmillar castle is a gem waiting to be discovered! Craigmillar castle doesn’t need the fame garnered by Outlaw King as it is an interesting location all on its own. The ancient ruin was a popular residence for horse-riding, hunting, and, most commonly, for plotting away from the watchful eye of the city, While the history of Craigmillar castle has very little to do with Robert the Bruce, it is tied closely to the fate of another royal- Mary Queen of Scots. So what is the real story behind the Craigmillar Castle history? Read on, and discover the surprisingly history of the castle. Craigmillar castle was originally outside of Edinburgh, until the city limits expanded widely enough that it is now included as being in the city. It is one of the most well-preserved castles in Scotland, as well as being incredibly photogenic from the southern end. The Preston family of Craigmillar began building the castle in the late 14th-century. It was extended over the two following centuries. The old ‘P’ shaped fish pond can still be viewed on the south side of the castle. In 1660, the castle was sold to Sir John Gilmour. The Gilmour’s left the castle during the 18th century, and it was during this time the castle fell into ruin. The labyrinth of stairs and rooms makes the castle an interesting and slightly confusing place to explore. It makes for a great family day out- children love exploring the many nooks and crannies of the castle. Craigmillar castle also offers stunning views of Edinburgh and Arthur’s Seat; it’s cousin, Edinburgh castle, can also be spotted from the top of the tower. One of Craigmillar castle’s most famous visitors was Mary Queen of Scots. She stayed here on two occasions; the first in September 1563 and the second in December 1566 after suffering an illness shortly after she gave birth to James IV- the future King who would unite Scotland and England. Queen Mary partook in activities such as archery, hunting and horse-riding here. The first thing you’ll notice about the castle is the two yew trees that line the entrance. These trees are believed to be hundreds of years old and are believed to have been planted in Queen Mary’s honour when she stayed at the castle. The wood from yew trees are often used to craft bows for archery, and they symbolise longevity and rebirth. It was during Mary’s second visit that the plot to dispose of her reckless husband, Lord Darnley, was hatched. The plan was called the ‘Craigmillar Bond’, and Queen Mary probably didn’t know about it. The decision was reached after Darnley burst into Queen Mary’s supper chamber at the Palace of Holyroodhouse with his men, who murdered the Queen’s Private Secutary, David Rizzio, in front of her. Lord Darnley was jealous of their relationship, and accused him of impregnating Queen Mary. Craigmillar was a safe haven for royals and nobles to go about their plotting, or to simply escape the politics of the city. Craigmillar castle is easily accessible in less than 15 minutes by bus from the centre of Edinburgh. For only £1.70 each way, or £4 for a day pass, jump on bus 8, 2, 49 or 30. Visiting Craigmillar castle is a fantastic budget-friendly activity that isn’t yet overrun with tourists- so visit while you can! Hiking in Scotland? Never go without an OS Survey map! Want to take a piece of Scotland home with you? I sell beautiful photographs of Scotland on printed canvas! Shop my favourite travel guides on Scotland. I have to admit I’ve never been to Craigmillar Castle – I didn’t know there was a castle so close to the city!! What a beautiful castle and with so much history! It’s amazing given the history it’s not as popular as other castles in the area. I think this will change now given it was an Outlaw King filming location! You’re right, the history of that castle is colourful enough! The plus side is that film fans will learn the history when they visit in pursuit of a cool cinematic backdrop. Everyone’s a winner. I hope the film brings more tourism to the castle- it’s truly stunning and I’m amazed it’s not a hugely popular tourist attraction. It may very well be now however! I’ve just watched the Outlaw King and although I’ve yet to make it to Craigmillar Castle, it is definitely on my list for 2019. Thanks for all the tips to help make my planning a bit easier! It’s a stunning castle and often overlooked thanks to Edinburgh Castle being so close. Have fun! The best photos are when you walk around the back of the castle into the field. SO excited to read this! Cannot wait to visit! I submitted my DNA on Ancestry.com and learned that Sir Simon Preston was my 18th Great-grandfather! When I saw the castle he built, although in ruins, was still able to be toured, I began researching and planning to visit! Hoping to stay at the Prestonfield House and perhaps see if I can find a tour guide who knows the history of the Preston family and the castle. In the meantime … I’m reading all I can find on the subject!